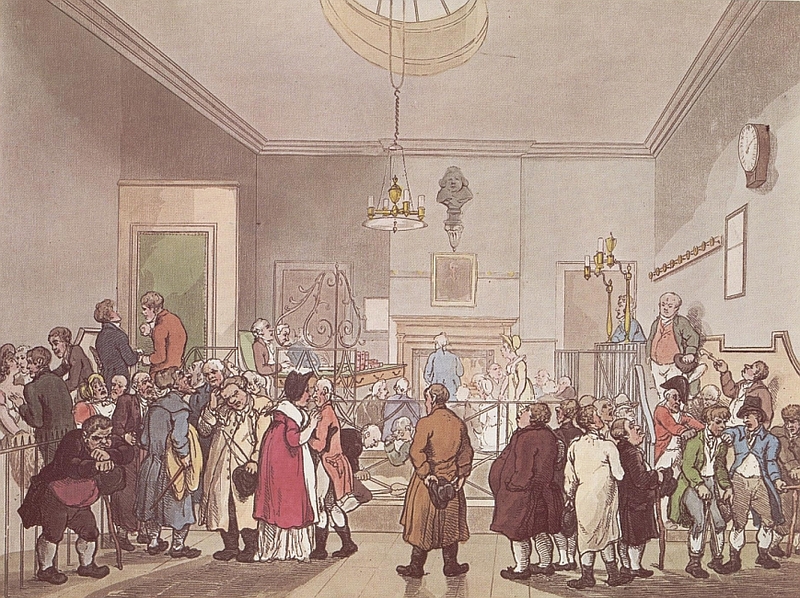 Magistrate’s court room, London, England by Thomas Rowlandson and Augustus Charles Pugin, Bow Street Office, from The Microcosm of London, 1808. Even in modern-day towns and cities, there are hierarchies of power: sometimes, the power runs within a certain family who dominates the area; other times, it’s through an organization; and sometimes, the power comes through governmental magistracies. In 18th century loyalist Saint John, the latter was most often the case. Constables, parish officers, clerks—any kind of governmental position in the loyalist city came with a semblance of power. Yet one of the dominant authorities in the entire country of Saint John were those responsible with the local enforcement of judicial and administrative standards: the Justices of the Peace. Justices of the Peace—or JPs as they are referred to contemporarily—have a long history, dating back as far as the 12th century. They originated during the reign of King Richard I of England as knights commissioned with ensuring the law and keeping the peace. It was in 1361, under the rule of King Edward III, that they were first officially entitled “Justices of the Peace”, which was used interchangeably with the title “magistrate” for the ensuing centuries. JPs were usually members of the English gentry, which explains why the magisterial title eventually included the title of “Esquire”, as well. Finally, during the Tudor Period (1485-1603) these justices became a truly essential element of the English government. JPs would conduct small-town courts, try minor criminal cases, and local law infractions; all in all, they would cut back on the number of judicial cases that would make it to the nation’s higher law courts and became an important cog in the English governmental and judicial system. The JPs had become a common magistracy in England by the 18th century, and were likewise adopted in British colonies, including those in North America. Grand Jury Presentment, Proclamation for Esquire Justices. New Brunswick Court of General Quarter Sessions of the Peace (St. John County), Minutes: 1812-1839. In terms of criminal justice in Saint John, the JPs could try minor offences, thereby acting as lower court judges. Besides acting as judges, though, the JPS were also responsible for taking the depositions of witnesses, examining defendants, issuing warrants and summons, and the bailing or gaoling (jailing) defendants. They were also responsible for binding both witnesses and defendants in recognizance to ensure their appearance at later trials; sometimes, if a defendant was unable to find people to give sureties for their appearance, JPs would offer their own money in order to keep the trial proceedings moving forward. Beyond these active responsibilities, the JPs also had to complete piles of paperwork for each criminal proceeding. Court Orders, Appointments. New Brunswick Court of General Quarter Sessions of the Peace (St. John County), Minutes: 1812-1839. Other times, the JPs could be appointed to access the Tax Accounts of the County, or to report on other magistracies in the county and the city. In this sense, the JPs influenced all sorts of spheres in the county of Saint John: criminal, political, economic, and civil. Historian David Philips argues that “for most people, the justices, rather than the central government…represented public authority as they would experience it in their daily lives.” The JPs were the closest thing to a local government to which the county of Saint John had access, and in that sense acted as the local ‘lords’ of the region. 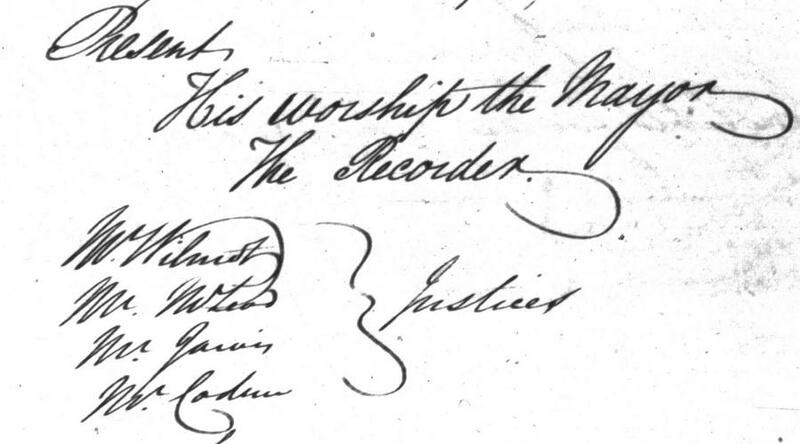 To see more examples of the ruling JPs in nineteenth century Saint John, and to learn more about the loyalist courts, check out Saint John County Court Records! T. C. W. Blanning, The Pursuit of Glory: Europe 1648 – 1815, Bristol: Allen Lane, Random House, 2007. Paul G. Cornell, “Justice of the Peace,” Historica Canada, the Canadian Encyclopedia, Last edited December 2013. Paul Craven, Petty Justice: Low Law and the Sessions System in Charlotte County, New Brunswick, 1785-1867, Toronto: Osgoode Society for Canadian Legal History, University of Toronto Press, 2014. David Philips, “The Black Country Magistracy 1835-60: A Changing Elite and the Exercise of its Power," Midland History 3, 3 (Spring 1976), 161. Cora Jackson is a student assistant for the Microforms Unit at the Harriet Irving Library. She is currently in her fourth year of her Bachelor of Arts degree at UNB in Joint Honours History-Classics.